Meena handles business sale purchase deals, negotiates and drafts commercial contracts, advises businesses on intellectual property, consults on copyright laws, and provides estate planning advice and will drafting services to professionals and business owners. Meena also represents franchisors and franchisees in distribution and franchise agreements. Before being called to the bar, she articled at Sobeys Inc. and interned with Davies Ward Phillips & Vineberg LLP, a prominent Bay Street law firm. Meena is also a trained mediator and has volunteered in various community programs in Ontario. 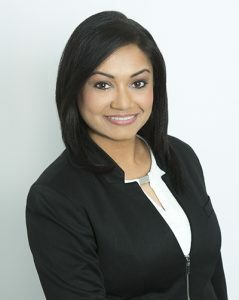 She is one of the founding members of Brampton Community Mediation Service, a community service that helps residents of Brampton to resolve family and neighborhood disputes through mediation and collaborative negotiation. Her training as a mediator helps her to actively listen to her clients and identify their needs, before providing suitable legal advice. She continues to contribute her time and mediation services to various community projects. Meena’s law practice is mainly solution oriented. She encourages her clients to negotiate commercial terms early in their business or employment relationships. She strongly believes that good contracts build better boundaries, thereby preventing future misunderstandings and disputes. She also advises her clients to plan their estate early to avoid disputes among future beneficiaries. To book free 15 minute phone consultation with Meena, please click here. Jham law specializes in Corporate, Commercial services and Business Law. Connect with our lawyers to see how we can help you. Use the booking button to secure your free consultation.